True Kelvin connection, each probe is connected to one SSMC connector, the ground/guard is shared. Requires only one micropositioner for 2 connections. Excellent for use with LCR's, or applications that require sensitive probe resistance correction through instrument "sense" line. Less than 10 fA resolution. Probe pitch (distance between probes) can be ordered from 12 to 100 um. Very low parasitic capacitance design. 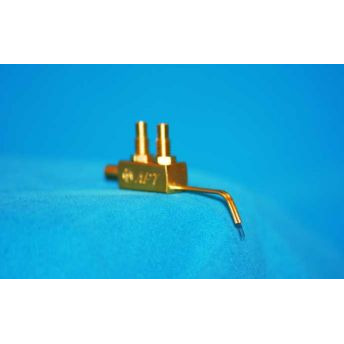 Material: Type II Gold plated brass/copper Connectors: Two SSMC connectors, with each being connected to one of the two semi-rigid coaxial probes creating a True Kelvin connection. The probe mounting shank is: 0.124" ~ 0.125". The probes of the 73APT-100K are not replaceable due to the co-planarity issues with the Kelvin contact. The typical probe contact co-planarity is within 3-5 microns.